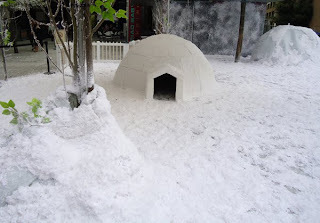 Winnibriggs House: ONLY 132 DAYS.................and a GIVEAWAY..! Yes....to Christmas, but I have to say in the last week or so it has seemed much nearer. 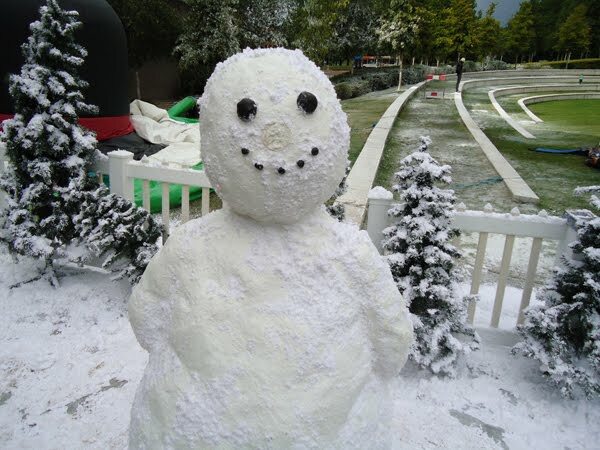 Well it wasn't exactly Santa's Grotto, but a snow festival in of all places Basingstoke! We had come for a weekend break at a lovely Spa hotel and took a ride into the town before dinner and this is what greeted us at the entrance!! ....loads of scrummy things for her own Seaside swap. I received fabric, and a handmade fish. 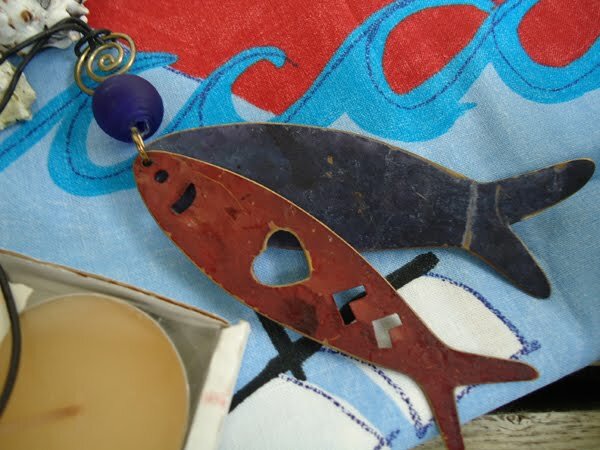 A necklace and some seashells thoughtfully sent by one of her daughters. There were also sweets, candles and a pretty bag of assorted beads. As you may know if you follow Aija's blog she has recently returned home after an operation and I was so surprised that she rushed to get this parcel to me before she was admitted. I had told her not to worry about it, so I am glad she received mine before she went into hospital. Thank you Aija ( and your daughter) the gifts are lovely. I hope you are taking it easy and are on the mend. This exquisite little silver cotton reel, hand made by Emma together with a pearl and a button on a silver chain. I am so thrilled with it. Thank you Emma you are so kind. Dandelion Soup by Babs Horton. If you have not read this and like something a little different you will not be disappointed. A bit of a mystery with shades of Joanne Harris, it really is one that you can't put down! So if you would like to win this book, (and a small gift too) and would be prepared to read it and pass it on, or pass on a book of your choice just leave a comment on this post. If you would like to grab the piccie too and pop it on your sidebar that would be great. I will leave the draw open until next Sunday 22nd August at midnight and post the result in the next week. Well I think thats enough for one post, I'll be back later in the week with some projects I have been doing. Hi Jenny, I can't bear the thought of Christmas talk in August!!! That's just tooooo much! I'd love to be included in the book give-away ... what a good idea! 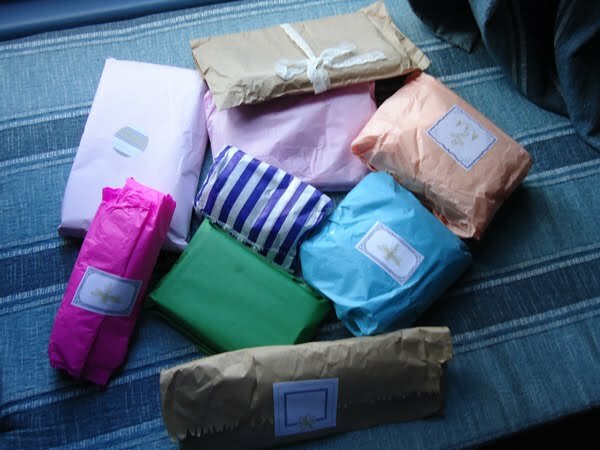 What lovely packages you received! We don't need any snow just yet do we? That book looks very interesting so please add me to your giveaway & of course I'm happy to pass the book on again - I do that a lot! If you get on with your Tylers Row book & want to swap it for another Miss Read book afterwards, let me know - I've several of her books I could swap with you??? 132 days left!! best I get crafting! 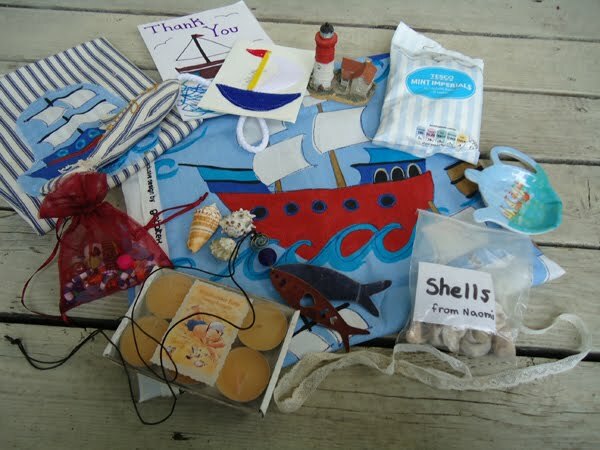 Looks like you had a great week with all those lovely goodies. Wish you hadn't mentioned the C word though - I can't bear the thought yet!! 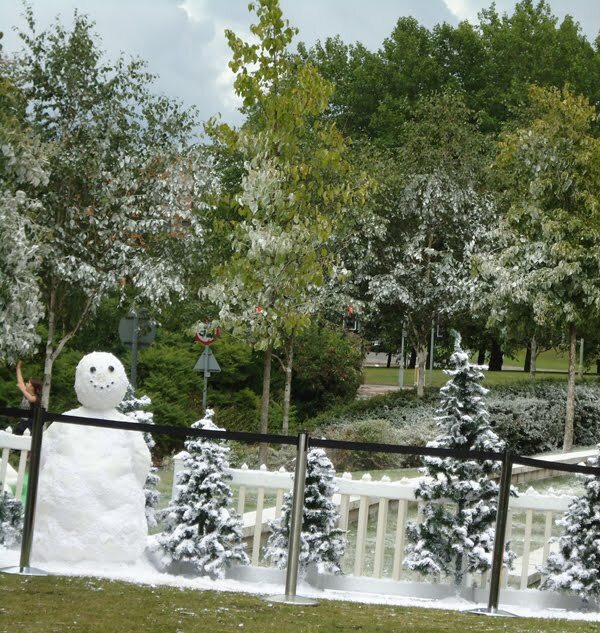 Fancy seeing snowmen in Basingstoke too!!! 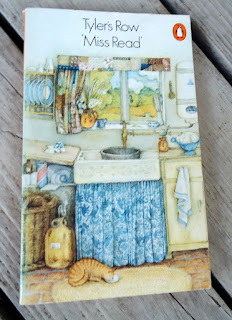 I read all Miss Reads books years ago and your post has reminded me of how much I enjoyed them and perhaps I should get them from the library and read them again - I always found her writing so restful and it took me back to childhood times. 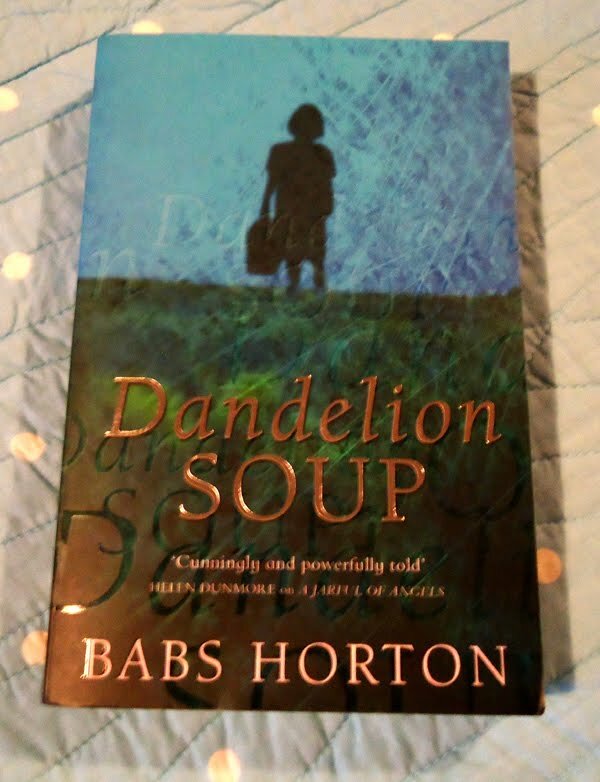 Dandelion Soup sounds interesting - I keep coming upon mentions of the route de Santiago de Compestala ever since living near Limoges where one of the routes passes and is marked on the pavements with brass shells! So would be interested in reading this story - might get it from the library when I look for the Miss Read books! hi- this all looks delicious! Seems like I'm the 1st - I'd love to enter the giveaway, "pass the book on" is a really good idea! Have a great week- sunshine here yay! i'll read anything and my hubby would love the idea of one book in one book out! 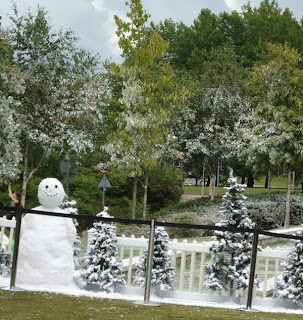 heres hopeing the weather near you isn't christmassy! We're currently on a Miss Read marathon here - Mother-in-law needs a cataract operation so we're having to read (no pun intended) to her! I'd love to enter the giveaway. Please count me in. I love getting new things to read. And let me know when you arrange another blog meet up please. I'm happy to know that it's not only me thinking already on Christmas. I have to say the snow looks wonderful and I would like a little of it here in California...it's been hot! What lovely treasures you received, it's always nice to get a package from a fellow blogger. Enjoy all your goodies! Thanks for stopping by my place Sweet Friend! 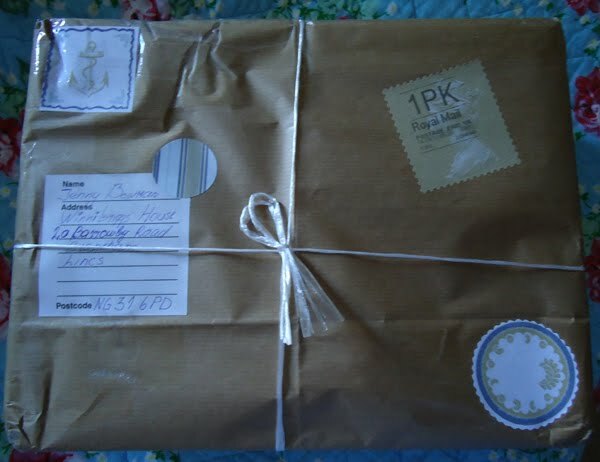 I am very glad you liked the parcel. I'm so so glad that you liked your necklace - and sorry about my inbox and its silly ways - I lost so many emails! That book looks so lovely and I'd love a chance to win, although it's funny to think of me sending you one and then you sending me one....! Hi Jenny. I'm not sure I've visited your site before but I'm glad I've discovered it. You make some lovely things. 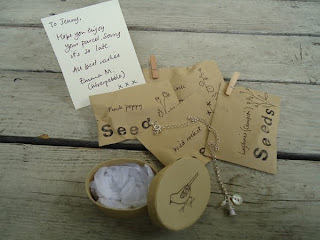 I was taken with those little packets of seeds that you've received – such a nice, neat gift. 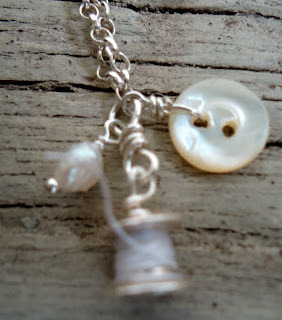 And the cotton reel charm seems a perfect personal gift. Please include me in your 'pass the book' giveaway – it looks so tempting that if I don't win it I will have to go out and buy it now!